The Static Mapping step of the wizard is available if you have selected the advanced networking option at the Networking step of the wizard. 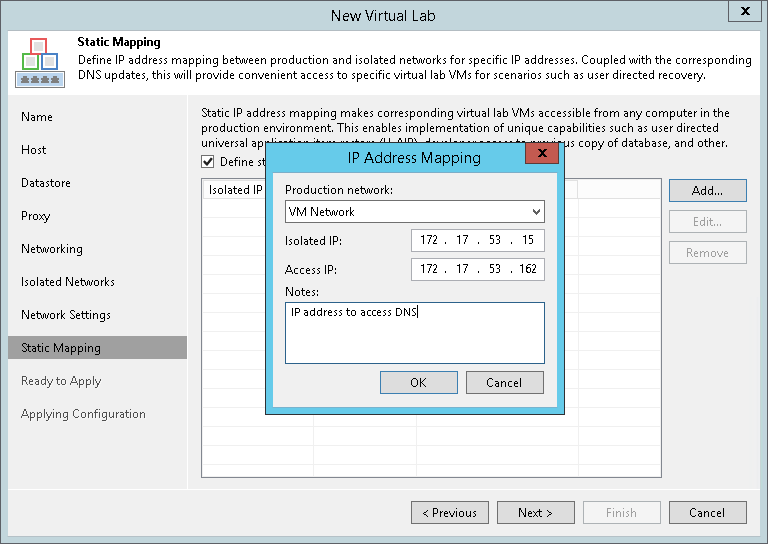 At the Static Mapping step of the wizard, you can specify static IP address mapping rules to make VMs in the virtual lab accessible from any machine in the production network. Select the Define static IP address mapping check box. In the Isolated IP field, specify an IP address of the VM in the production network. In the Access IP field, specify an IP address in the production network that you want to use to access the VM in the virtual lab. You must use an IP address that is not allocated to any machine yet. It is recommended that you assign an access IP from the same subnet where the proxy appliance resides. In the opposite case, you will have to configure routing rules for the access IP manually. In the Isolated IP field, you must define its production IP address — 172.17.53.15. In the Access IP field, you must define any free IP address from the production network, for example, 172.17.53.162. After a virtual lab is created and VMs are started in the virtual lab, you will be able to access the DNS server in the virtual lab from the production environment by IP address 172.17.53.162.